Although the Congo is one of the wealthiest nations in natural resources such as diamonds, copper and minerals, it is also one of the poorest with more than one million people dying every year from malnutrition, starvation and disease. Come experience life in the Congo through inspirational Congolese artworks on display in the UT Office of Multicultural Student Services in Student Union Room 2500 on Main Campus. 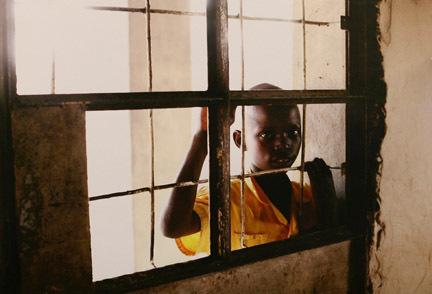 “Children of the Congo,” a photo exhibit by UT alumna Stephanie Matthews, was created in an effort to encourage greater understanding of the culture and spirit of Congolese children. Matthews presents the photos without frames and glass covers so nothing stands between the viewer and images. Story cards are placed among the staggered images so viewers can try to understand the realities the children face. The “Art of the Congo” exhibition contains mixed-media artworks from several Congolese artists. 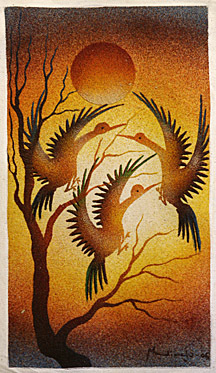 The works depict African life and landscapes and are made from copper, leather and sand. “Art of the Congo” is on loan from the African Cultural Initiatives for Peace and Development and support from UT’s Students in Free Enterprise. The pieces are for sale to provide financial assistance to the Congolese artists. The exhibits can be seen Monday through Friday from 8:30 a.m. to 5 p.m. through Thursday, March 5. For more information on these free, public exhibits, contact Grant at 419.530.2261. This entry was posted on Monday, February 23rd, 2009 at 5:05 am and is filed under Arts .